Injecting or pumping water into an aquifer for storage and use at a later time is known as Aquifer Storage and Recovery, or ASR. This is the concept of ASR: during times of plentiful water, extra water can be withdrawn from a river (or other source) and then injected and stored within an aquifer. When the original water source runs low due to drought, low rainfall or other causes, this water can then be pulled from the aquifer and used. Some ASR facilities inject treated wastewater rather than surface water into an aquifer, while other facilities inject groundwater from a different aquifer. The idea behind ASR is not new; nomads have utilized a rudimentary form of this technology for centuries in present-day Turkmenistan. Rainfall captured in trenches is funneled toward and infiltrated into more permeable sand dunes where it is later recovered by way of hand-dug wells. The first ‘modern-day’ ASR facility was constructed in 1968 in Wildwood, New Jersey; this facility is still in operation. Currently, ASR is utilized in 11 countries. There are 95 facilities in the United States. 1. The City of El Paso developed the first facility in the state in 1985. 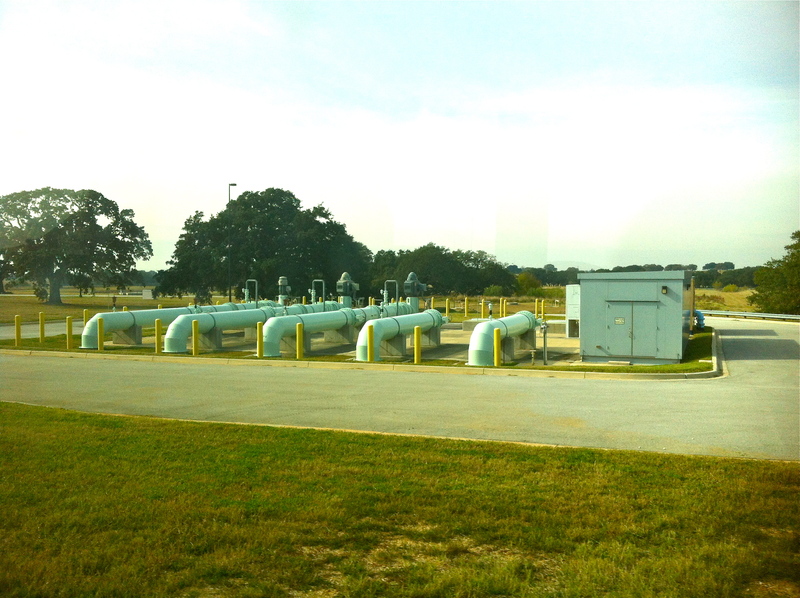 This facility injects 10 million gallons per day (mgd) of treated wastewater into aquifers 300 to 835 feet below the ground. 2. The City of Kerrville is the only facility in the state that utilizes the traditional ASR method: more than 2.5 mgd of water from the Guadalupe River is injected into wells 500-600 feet deep. 3. The largest facility in Texas is the 60-mgd-facility south of San Antonio. Here, water from the highly permeable limestone Edwards Aquifer, the City’s primary source, is injected 400 to 600 feet into the sandy, less permeable Carrizo Aquifer. Source waters (surface or groundwater) could be overutilized to fill ASR systems. If permits to withdraw source water do not have sufficient environmental flow standards, they could drive decreased stream flows, spring flows, or groundwater level declines. Like most other states, Texas requires that before water is injected into an aquifer, it must be treated to drinking water standards. However, differences in water chemistry between the injected water and receiving aquifer could cause metals such as arsenic, hydrogen sulfide or uranium in the surrounding geologic formation to dissolve in the injected water. ASR source water generally has to be treated both before it is injected as well as after it is withdrawn. This treatment, along with pumping the water to and from the ASR facility, makes ASR more energy intensive than some other water supply options. The largest environmental benefit of utilizing ASR as a water supply strategy is that it can potentially offset the need to construct more environmentally damaging projects such as dams and creating reservoirs on Texas rivers. Not only do reservoirs have significant ecological impacts to our rivers and bays, they also result in the loss of prime agricultural timberlands. ASR projects do suffer some ‘loss’ of source water to the aquifer, depending on the characteristics of the aquifer. However, these losses pale in comparison to the considerable volumes of water lost to evaporation from surface water reservoirs, especially in Texas. For example, the San Antonio Water System ASR is estimated to store between 224,000 and 242,000 acre-feet. This volume of water is similar to the conservation capacity of Lake Arrowhead (surface area of 5,369 acres) near Wichita Falls. It is estimated that evaporative losses in 2011 in the Wichita Falls area approached seven feet per acre, resulting to a loss of over 35,000 acre-feet of water from that reservoir in a single year. While environmental concerns about ASR do exist, many of these concerns can be addressed through careful management and operational safeguards. On the other hand, the environmental damage and socio-economic disruption associated with dam and reservoir construction is large and essentially unavoidable, not to mention the water that is wasted through evaporation losses. In areas of the state that have already experienced significant groundwater level declines, ASR as a water supply strategy appears especially pragmatic due to the increased storage capacity in the depleted aquifers. This is especially true in the Dallas metroplex area, where current reservoir strategies are creating heated interregional conflicts. The Texas Living Waters Project is a collaboration of conservation groups working to transform the way we manage water so there will be enough for our wildlife, our economy and our kids. Forever. You'll be the first to know when we release our short film online. Plus, you'll receive our email newsletter with the latest Texas water news and adventures. Don't miss a drop of water news! Join our email community.